It’s always good to have something to look forward to at this time of year. It’s cold, the days are short, and three-day weekends are few and far between. You’ve got to keep your spirits up. Luckily for horse lovers, there’s an exciting event coming at the end of February that’s sure to do the trick: the 17th annual Horse World Expo. It’s the perfect opportunity to meet equestrians, network with industry professionals, shop, and enjoy expert horsemanship demonstrations. And with a variety of compelling horse trailer discounts on offer, it’s also the perfect time to chat with Blue Ridge Trailers about your travel or hauling needs. Curious about the 2019 Horse World Expo? We’ve answered all the biggest FAQs about the event below. What Is the Horse World Expo All About? The Horse World Expo brings hundreds of horse lovers and professionals together for a weekend of education, entertainment, competition, and fun. Are you a horse industry professional? A horse owner or rider? A parent of a young equestrian? You’ll love the exciting line-up of speakers and shows at this year’s Horse World Expo. For example, there are presentations on everything from horse behavior and communication, to equine farm management, to the true story of a pony’s life-saving work with Marines during the Korean War. 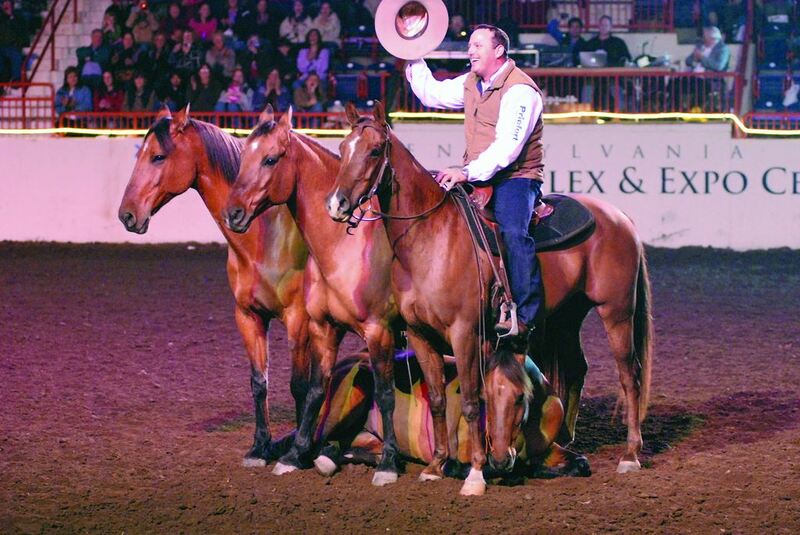 There will also be a Theatre Equus musical equine revue at 8:30 p.m. on the Friday and Saturday of the expo. Feb 28: Noon to 8 p.m.
March 1: 10 a.m. to 8 p.m.
March 2: 9 a.m. to 8 p.m.
March 3: 9 a.m. to 5 p.m.
Daily general admission is $15 for adults and $6 for kids ages six to 12. Kids under six enter for free. Tickets can be purchased with cash at the event door. I Need Info About Horse Trailers. Will I Find It at the Horse World Expo? You can count on it! The Horse World Expo is one of our favorite annual events here at Blue Ridge Trailers, and our team will be on-site with educational materials and event discounts for a variety of horse trailers (more on that below). Look for us at Booth Q, at the opposite corner from the Round Pen Area. We’ll have a monitor set up for presentations, including our “Trick Out Your Trailer” presentation—it’ll teach you about unique trailer accessories and add-ons you can put in your trailer to increase horse comfort and safety. Our team will also be available to educate you about choosing the right trailer for your needs, how trailer manufacturers differ, issues with servicing trailers, and more. What Horse Trailer Deals Will Be Available? Blue Ridge Trailers is offering discounted trailer prices to any attendee who buys a trailer at the Horse World Expo—whether you leave with it that day, transport it later, or commit to buy within 30 days. Every trailer we offer comes with a 20-year warranty on Rumber flooring, a durable, easy-to-clean material that reduces muscle fatigue in horses. Blue Ridge Trailers is always happy to answer questions and help you make the right decision for you and your horses. Contact us online or at (434) 985-4151. We hope to see you at the Horse World Expo!